Former UK PM Tony Blair has been appointed by US President George Bush as the Middle-east envoy but as peace activist Uri Avnery notes: "Blair will come, meet, make declarations, ooze charm from every pore, generate headlines, fly, come back, make more announcements, meet again with kings, presidents and prime ministers. A long tail of news-thirsty journalists will follow him everywhere, generate media noise, write, tape and take pictures as if he were a male Paris Hilton. Meanwhile, Palestinians and Israelis will keep dying." Because no one wants to confront the injustice of Israel's occupation of Palestine. The four leaders at Sharm al-Sheik in June 2007 did not sit together at an intimate round table. Each one sat alone behind a huge table of his own. That ensured a striking separation between them. The four long tables hardly touched. Each one of the leaders, with his assistants behind him, sat like a solitary island in a vast sea. All four - Hosni Mubarak, King Abdallah of Jordan, Ehud Olmert and Mahmoud Abbas - bore a severe countenance. Throughout the official part of the conference, not a single smile could be seen. One after the other, the four delivered their monologues. An exercise in shallow hypocrisy, in empty deceit. Not one of the four raised himself above the murky puddle of sanctimonious phrases. A short monologue from Mubarak. A short monologue from Abdallah. A medium-length monologue from Abbas. An interminably long monologue from Olmert - a typical Israeli speech, overbearing, educating the whole world, sermonizing and dripping with morality. Held, of course, in Hebrew, with the obvious aim of appealing to the home public. The speech included all the required phrases - Our soul longs for peace, The vision of two states, We do not want to rule over another people, For the good of coming generations, bla-bla-bla. All in standard colonial style: Olmert even talked about "Judea and Samaria", using the official terminology of the occupation. But in order to "strengthen" Abbas, Olmert addressed him as "President" and not as "Chairman", which has been the de rigueur title used by all Israeli representatives since the establishment of the Palestinian Authority. (The wise men of Oslo circumvented this difficulty by referring - in all three languages - to the head of the Authority by the Arab title of Ra'is, which can mean both president and chairman. And the word that did not appear throughout this long monologue? OCCUPATION? What occupation? Where occupation? Anybody seen any occupation? With the air of a Sultan throwing coins to the paupers in the street, Olmert announced his intention of releasing some Fatah prisoners. 250 coins, 250 prisoners. That was the "generous gift" that was to make the Palestinians jump for joy, "strengthen" Abbas and awaken to new life the dry bones of his organization. If Olmert had not been sitting so far away from Abbas, he could just as well have spat in his face. agenda of this dark summit. First at all, the number is ridiculous. There are now about 10,000 (ten thousand) Palestinian "security" prisoners in Israeli prisons. Every night, about a dozen more are being taken from their homes. Since there is no more room in the prison facilities, the wardens will be pleased to get rid of some inmates. In previous gestures of this nature, the Israeli government has set free prisoners whose term was nearing the end anyhow, and car thieves. Second, fraternization between Fatah and Hamas is well established in prison. The violent struggle in Gaza has not been projected into the prisons. The famous "prisoners' document", which laid the foundation for the (now defunct) Unity Government, was worked out jointly by Fatah and Hamas prisoners. Olmert's announcement of his readiness to release Fatah - and only Fatah - prisoners is designed to sabotage this unity. It could stigmatize the Fatah people as collaborators, and Abbas as a leader who is concerned only with the members of his own organization, not giving a damn for the others. The sign over the table says "Sharm-Al-Sheikh summit," and the legs of the table are labeled "Abbas government," "Israel," "Egypt," and "Jordan." The figure lying on the ground is labeled "Hamas." 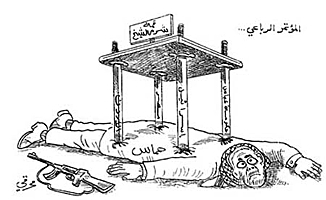 This graphic appeared in the Akhbar Al-Khalij (Bahrain) on June 25, 2007. SO WHAT did come out of this summit conference? Some say: zero plus, some say: zero minus. No wonder that the Arab participants looked so somber. What was it good for? Abbas was in need of strengthening after losing the Gaza Strip. Olmert promised the Americans to strengthen him. But after the conference, Olmert could have used the phrase customarily uttered by Israeli leaders visiting bereaved families: "I came to strengthen, but it is I who have been strengthened." The sole winner was Olmert. The conference has proved that Mubarak's and Abdallah's influence on Israel is nil, and that Abbas' position is even worse. To eliminate any doubt about this, Olmert sent the army at once into the kasbah of Nablus, the heart of Abbas' virtual kingdom, in order to "arrest" the leaders of the military arm of Fatah. They put up determined resistance, wounding several soldiers. A lieutenant lost a hand and a leg. In another incursion, this time into Gaza, 13 Palestinians were killed, including a boy of nine. According to the official version, the aim was to throw the militants off balance so that they would feel hunted. If this is not occupation, what is it? But God forbid that anyone mention this word in diplomatic discourse - the ten letters that have turned into an obscenity. A ten-letter word that has become taboo in polite society. THE DISAPPEARANCE of the occupation as a subject for discussion is the real message of the conference. All the arrangements and ceremonies were designed to create the false impression that Olmert and Abbas were the heads of two states conducting negotiations on the basis of equality - rather than the leader of an occupying power and a representative of the occupied population. That is true for all the discourse about the Israeli-Palestinian conflict at this stage: the world has become so used to the occupation that its very existence has ceased to be a subject for discussion. That is also evident in the daily reporting on the conflict in the Israeli and foreign media. They report on what's happening - the Gaza take-over by Hamas, the actions of the Israeli army, the problems of Abbas, the decisions of the Israeli government - without the context of the occupation. As if the occupation, with all its killing, destroying, depriving and dispossessing, were a natural phenomenon like the light of the sun during the day or the twinkling of the stars at night. There are many subjects that are being discussed, such as: whether to ease the situation of the Palestinians or to increase their misery, whether to allow Abbas' policemen to move freely with their weapons in the West Bank towns to try and eliminate the militias that fight against Israel, whether to enlarge the settlements or not. But all these discussions are based on the unquestioned assumption that the occupation is there forever. All the talk about "strengthening" is conducted in this context: Abbas and his people are supposed to function as an administration under occupation. According to Olmert's and Bush's perception, their job is to fulfill the orders of the occupation, in return for their own money and perhaps some small arms. Incidentally, that is very similar to the "autonomy" promised by Menachem Begin to the "Arab inhabitants of Judea, Samaria and the Gaza District". Olmert is quite ready to talk about the "Two-State Solution" - much talk, with a lot of bloated words and pathos - while doing everything possible in practice to prevent this "vision" from being realized before the coming of the Messiah. INTO THIS reality Tony Blair is now stepping. He is being sent by the Quartet - something that does not really exist, a diplomatic fiction of four that are one. Europe does not exist as far as the Israeli-Palestinian conflict is concerned, except as a financial instrument of the White House. When the President of the USA wants it, Europe sends alms to the Palestinians (and arms to Israel). When the President of the USA wants to starve the Palestinians, Europe imposes a blockade on them. So what is Blair's appointment for? to a redundant international star? The UN has long ago become an instrument of the US Department of State, especially in the Middle East. When the American drill sergeant shouts, the UN jumps to attention or stands at ease. Russia dreams of regaining the status of a Great Power. As in the days of the Czars and Stalin, it thinks in terms of "spheres of influence". The Middle East is an American sphere of influence. Therefore, Russia will not interfere, except by mouthing high-sounding phrases. The Quartet is simply an American front organization. And Tony Blair is sent to Palestine as a special envoy of President Bush. The master sends his poodle. What for? If Bush really wanted to realize his "Vision" of two states, he wouldn't need Blair. He could do it all alone in a matter of weeks. Even poor Condoleezza could do it, instead of babbling about preparing final-status plans and pigeon holing them, if only she were backed by the determined will of the President. So what is Blair's appointment for? Is it only to give some status to a redundant international star? To give a consolation prize to somebody who loyally lied and cheated for Bush before and during the Iraq war? Yes, of course. But his main task is to draw out developments and gain time, to postpone everything, to foster make-belief activity, to provide the Palestinians and the world media with an illusion of progress. Blair will come, meet, make declarations, ooze charm from every pore, generate headlines, fly, come back, make more announcements, meet again with kings, presidents and prime ministers. A long tail of news-thirsty journalists will follow him everywhere, generate media noise, write, tape and take pictures, as if he were a male Paris Hilton. Meanwhile Palestinians and Israelis will keep dying, the wall will be finished, more land will be expropriated, settlements will be enlarged, targeted "terrorists" will be killed, the blockade on Gaza will be tightened, and all the hundred and one daily activities of the occupation will go on, the occupation that dares not speak its name. The declared task of Blair, too, is to "strengthen Abbas". Woe to the task. Woe to Blair. Woe in particular to Abbas.